It is 1969 and the youth of America are lost. These young people have all the physical trappings of happiness but don't know who they are, where they belong, what is expected of them. More of them are going to college than ever before, where they learn to think independently, to question the status quo, and to reject their parents' long-held, arbitrary definitions of morality, success, and happiness. These young people see racism run ranlpant in America, with lynchings still common in the South. They see American youths shipped off to southeast Asia to fight a war which has nothing to do with America and which appears to be unjust, immoral, racist, and impossible to win. They see disregard for the environment in the unchecked progress of American industry. And they see a culture that now worships at the feet of a new God – consumerism. What do these kids want? They want to erase all the rules and start over, creating a new society that makes sense, one built on the idea of celebrating all the wonderful, magical, indefinable things that make us human, the things that unite us, the things that join us to the rest of the natural world. They ask why we have such restrictive rules of sexuality. Is it because some long ago culture wanted to control inheritance? Or was it about the perpetuating of a particular ethnic group? Why do we have such restrictive rules about drugs? Is it because once we taste the liberation of mind-expanding substances, we'll be harder to control? Why do the adults who drink like fishes at cocktail parties so self-righteously condemn marijuana? Why do they so strongly condemn all drugs, when so many other cultures highly value the ritual use of hallucinogenic drugs to achieve a higher level of consciousness and to find God? Why do so many people call themselves people of faith but act in such immoral ways? Our tribe has not come to insult you or the values you hold dear. Our intention is not to shock or upset -though we may do that too. We have come to celebrate our humanness, the joy of living, our connection to each other and to the world around us, our God given sexuality, and the wonders and mysteries of the human mind and body. We have come to ask you to join us in rejecting violence, hatred, fear, and judgement wherever we find it, to question the way things have always been, to look at the world with a fresh eye and to resolve to change the things that need changing. Especially here and now, in the year 2000, an election year, consider whether we need more guns in the world, whether we value our children enough, whether we value our freedom enough, whether we value our planet enough, and whether people should be discriminated against because of the way they look or who they fall in love with. It is a new age. Everything is ready. It's time to change the world. Hair was the first show I have ever done where I really felt as though I was saying something important; and, perhaps even more importantly, it was the first show I have done where I really believed in what I was saying. Though the show is over thirty years old, any criticisms about the show being “dated” have never held much weight with me. While the main conflict (Vietnam) is no longer being fought, the scars of that war live on to this day, just as many of the other issues in the show do (racism, acceptance of those different from you, the ridiculous and arbitrary way society stigmatizes all recreational drugs). As I became more and more involved in the show, everything we were fighting for in the show became more important to me, and I actually began to understand how it must have felt when people began reaching out to one another in the sixties, with the hopes that they would actually make the world a better place. My relationship with Miller began just over ten years ago. I was a bright-eyed, clean shaven optimist a year out of college who thought, after one too many drinks most likely, I was to be an actor. Miller cast me in my first St. Louis show, Deathtrap, a play he was producing for another company while finding his way with New Line. It was only my second show, but he gave me a shot as the manipulative Clifford, and my acting career was on its way. The next seven years snaked me from local to regional stages, to national tours, and finally landed me in L.A. for a spell struggling in film and television and honing my extracurricular skills. I retired from acting at the ripe old age of thirty and moved back to St. Louis. And there I found a thriving theatre community with New Line as one of the major players. 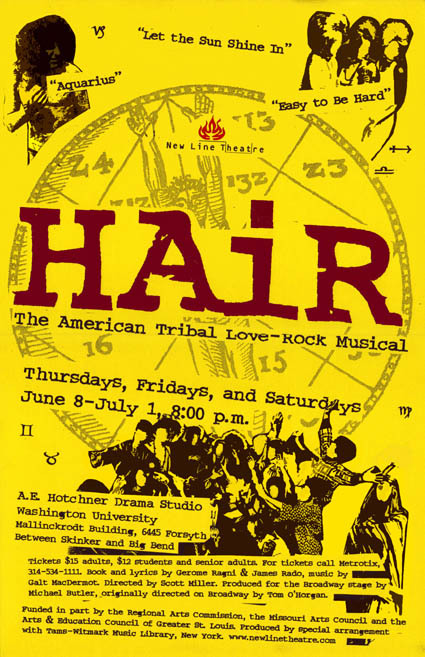 Chances are I would’ve stayed from the footlights, happily grinding the stone at a warehouse, had it not been for an audition notice in the RFT – HAIR, the Tribal Love Rock Musical from the late ’60s to be produced by New Line and directed by Miller. A show I had always wanted to perform, but never had the opportunity. I couldn’t pass on at least auditioning. Whether Miller had been drinking or smoking too much on the evening of his final casting, he graced me with the role of Berger – a decision that will forever bond me in his creative and artistic debt. A role that enabled me to exorcise some demons within. A show so powerful as to compress yet amplify scores of emotions for those who experience it. Hair is a show in which the Whole is certainly nothing without its Parts, but also where the Parts are nothing unto themselves until summed. Yes, we all know “Aquarius” and the title song “Hair,” and most of us recognize “Easy to be Hard.” But the book itself is a series of mostly non-linear nonsequitors strung out in a drug-induced mélange thinly plotted against the political and cultural climate of the times. Or is it? The rehearsal process was none as I had ever encountered. At times frightening – at others liberating. The story line was confusing; the characters sporadic. A lead role was changed with less than a week before curtain. I admit I was unsure of how the final outcome would translate, but my faith in Miller never waned. On final dress, everything made sense. The power of the music and the message of the show, under the eccentric guidance of Miller, came searing through in synaptic waves. We all felt it. We all got it. Nearly every night after rehearsal, a small group would get together for drinks and eats. I thought it important for the Tribe to bond off-stage as well as on. And although the participants shifted from night to night, Miller and I were steadfast. This gave us a wonderful opportunity, outside of rehearsals, to discuss and dissect not only the show, but a multitude of topics relating in large and small or none at all ways. And through this discovery and revelatory process, Miller was able to instill acceptance and trust and fuel me to portray what I hope was a truthful performance. As for the show itself, he brought out the passion and power that it truly possesses. He dug to the core and revealed the moral meaning behind it all. Propelled by an improvisationally talented group of musicians, a subtle yet dramatic lighting design and the freedom of a skeletal set, Miller brought Hair to life and drove it marching and protesting into the hearts/minds/souls of those in the seats. And as with all the pieces I’ve seen New Line produce and Miller direct, he gave audiences the Truth. Not one person who experienced this show, be him spectator or performer, walked away unaffected. Did I experience change? Certainly. Will I perform again? Hard to say. But Hair definitely puts a helluva capper on a spotty, sporadic decade of performing. I am emphatically proud of that show and am honored to have been a part of it. And although New Line revived the show the following summer, there were changes in my life that made me unable to get on the bus. A month after we closed Hair, I became a father. Unfortunately, the geographical location of my baby boy, Nicholas, was not in St. Louis. Therefore, a move by me was imminent. It’s possible I could’ve worked out the logistics to allow me to perform in Hair 2001, but there was another reason that kept me away. As I’ve said, I always wanted to do Hair. And truth be told, I’d always wanted to perform the role of Berger – that free-spirited, make love not war, primordially driven wild man. And in the summer of 2000, I accomplished just that. But to do so, I had to confront a lot of characteristics and behaviors, emotions and issues I had experienced in the not so distant past. Hair 2000 was in no small part a huge therapy session for me. I learned a lot that summer – about myself, and about others. And I have Miller and the entire cast (and, of course, Hair) to thank. But to reprise the role of Berger for another production would’ve tainted the seminal experience I had had. It would’ve been too painful, and I would not have been able to do the character, and ultimately the show, justice. The tools I had used to embody him were no longer available to me, and my performance would’ve been merely perfunctory. And to me, that is unacceptable. 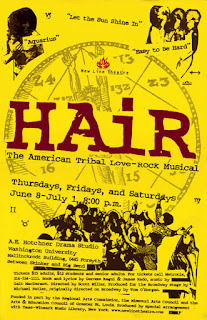 However, I was able to come back and see Hair 2001 as an audience member. And Berger, Claude, the entire tribe and band were a treat to behold. They had taken it to yet another level. And that made me smile immensely. I may never have the opportunity to work with Miller and New Line again, but I cherish the moment when I did. They do important work for the St. Louis community. They bring forth Honesty and Integrity with each production they stage. Support this company. Support the Arts. Without them, we are pedestrian. Without them, we are empty. I could scarcely contain my surprise when Hair really came together, and I do mean in a big way. Not only were our audiences totally digging our performances, but as a group, our Tribe was bonding in a way that no one expected. The myth that “doing Hair will change your life” was really true. I cried myself nearly to sickness and shrieked myself hoarse each night because the show and the pain of experiencing that life had become so real to me. I wasn't just playing Jeanie; I was her, and these were my dear friends who were being sent to fight a war, many never to return. And while I often can't verbalize the power this show has on those of us who are lucky enough to bring it to life, I choose to think of our Tribe as messengers. Messengers who had only one month to share our knowledge with as many people as we could. Scott Miller cast me in his 2000 New Line Theatre production of Hair as Claude despite the fact that I'm twice the age of the character and have short hair. The hair, as it turns out, was not such a big deal. Since Claude returns at the end of the play as a short-haired specter in an Army uniform, wearing a wig was very appropriate to play him. Now, I know nothing about wigs. Where would I go, then, to find a wig that would not only look good but would stand up to a punishing evening on stage? Obviously, to a drag queen. My friend, Michael, is well known in the St. Louis drag community as his alter ego, the ultra-glamorous Erica Fox. Since Erica had won the Miss Missouri Entertainer of the Year award on more than one occasion, I knew Michael/Erica would be my first choice as wig guru/gura. “Really?” I asked, looking at my reflection in a hand mirror, unused to seeing my face framed by so much hair since I had been, well, Claude's age. “Yes, really,” he said, scooping it off my head. “Now, let me show you how to clean it.” Clean it? There are instructions for how to clean it? “No. Mr. Clean.” He reached under the sink and poured the cleaning fluid into the sink. “Mr. Clean!? !” I said, more loudly than I'd intended. I followed Michael's regimen faithfully, subjecting the space-age polymer hairpiece to harsh chemicals before each weekend of our run, and, like the phoenix, it rose in glory each time. While I'm sure the wig fooled no one into thinking I had seriously long hair, and while I'm sure no one thought I was really in my twenties, it all worked. 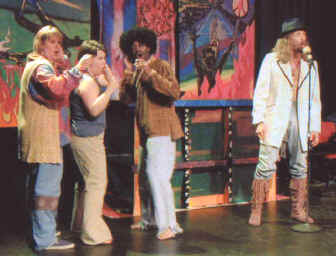 When Claude returned to the stage in the final scene, dressed now in an army dress uniform, hair now in a buzz cut (my real hair, dyed to match the wig), I could hear people in the audience gasp, and as I sang the plaintive last reprise of “Manchester, England” in counterpoint to the protest song of the Tribe, I could hear them start to cry. But that's New Line. While some people need chandeliers, roller skates, and helicopters, New Line just needs an authentic, aging hippie and a linoleum wig to create magic. I put Hair into our season without really knowing much about it, aside from its more famous songs and its movie version, which I knew was very different than its stage incarnation. Luckily, early in the rehearsal process, I discovered online a discussion list about the show that included among its subscribers members of the original Broadway cast and Michael Butler, the show’s original Broadway producer. Thank God for them. Learning the music was easy enough (though I’m glad I didn’t have to memorize any of those list songs). But once we started blocking the show, I was lost. The script didn’t make sense. There were virtually no stage directions. I found the archives of the discussion list and read every post. I started asking lots of questions. And slowly the show started making a little bit of sense. Their best advice was to Trust the Show. The rehearsal process became a kind of spiritual journey, a test of my trust. I did as they asked. I stopped worrying about the show. I stopped wondering how we would pull it off. I had trust. And I think it was that trust that kept the actors from freaking out completely. Despite the fact that they didn’t think it could ever come together, they saw no worry in me. And sure enough, once we the put the show on its feet and once we got it in front of an audience, almost everything started making sense. We found all the emotion, all the spirituality, all the genius of this wild and weird show. But I owe Michael Butler, Nina, and others on that Internet list a great debt of gratitude. Hair changed my life.